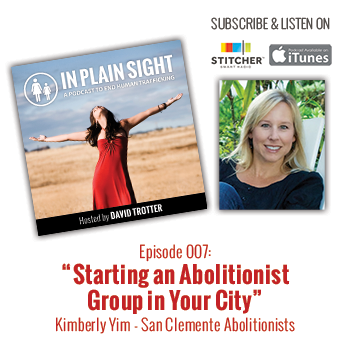 Kimberly is the author of “Refuse To Do Nothing: Finding Your Power to Abolish Modern Day Slavery” and founder of the San Clemente Abolitionists in San Clemente, California. Through local events, film screenings, and fundraisers, they work to educate and engage their local community to fight the injustice of human trafficking. Their focus is on tangible actions that everyday ordinary citizens can do right in their everyday life. How Kim started the San Clemente Abolitionists. 3-4 things you need to start a group of your own. What she wishes she would have know before starting. Listening to Kimberly Yim on how to start an abolitionist in group in YOUR town. Great stuff!!! Glad you enjoyed it. Spread the word about the podcast so that others can benefit. Kimberly’s interview was both enlightening and affirming. Our little organization, Cross Won Out, began in a similar fashion. Although at times it feels like we are groping in the dark, we have been able to help other organizations open homes for trafficking survivors. I like what Kimberly said, ” faithfully do the next step in front of you”. Beth – join us over at our FB group if you haven’t already – http://www.facebook.com/groups/teamhopeandfreedom.